How I Gained It: I have always been big. I just read an article that said if you are over 8 pounds, 7 ounces at birth you are considered a large baby. Well, I was 8 pounds, 9 ounces, so right off the bat I was bigger than most kids. While I was growing up I never really exercised. I was diagnosed with severe asthma that made it hard for me to do much of anything for any length of time. I would play outside and ride bikes and go swimming, but that was about it. And that was only during the summer. Since we live in Wisconsin, playing outside in winter is possible, but only when it’s not super-cold, and usually that is just to go sledding. 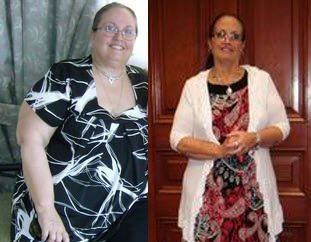 When I got pregnant with my daughter, I developed severe preeclampsia and got up to 263 pounds. My blood pressure skyrocketed and my doctor put me on medication. Breaking Point: I was sitting at my computer one day in March of 2011, and I read an article written by Dr. Oz. In the article he was talking about how to lose weight and he said cutting out just 100 calories a day could result in dropping 10 pounds in a year. I had been diagnosed with cervical cancer in December 2010, and I figured the healthier my body was the more likely I was to beat the cancer. I was drinking at least six sodas per day, so that really got me thinking. I did the math and realized by stopping drinking soda I could easily cut out over 700 calories a day, just that easily. How I Lost It: I started drinking sparkling water instead of soda. If it wasn’t for that stuff I would have never been able to give it up. It tastes just like soda, but without any calories, sugar or sodium. I keep a huge supply of it on hand at all times! In the first month I dropped over 12 pounds, by just not drinking soda. Then, I decided to actually try to start eating healthy. This is hard for me, especially at night. I suffer from severe insomnia. I am awake every two hours, like clockwork. Before, I would get bored or a little hungry and eat a whole TV dinner. I have since discovered I am a huge fan of guacamole! Now, at night when I wake up, I have some guacamole and some tortilla chips and that satisfies me for the next four times I wake up, so I don’t eat anything else. I eventually thought about trying to lose more weight. My first goal was to get down to 200 pounds. That happened within a few months, so then I decided to get down to 184. That happened shortly thereafter. I just kept adjusting my goal weight as I would reach the next one. I stepped on the scale today at 138. I am beyond thrilled. To get to this point I have been extremely disciplined about eating. I went from eating any and everything I wanted to knowing how much fat and how many carbs are in basically every piece of food on the face of the earth! I read tons of articles about weight loss and did a lot of research to educate myself so I would know off-hand what I should eat and what I should avoid. I discovered that salad dressing doesn’t have to be creamy to be good. I love fat-free Italian dressing. Put a touch of parmesan on the salad to give it some protein, and it tastes just like a Caesar salad! I found that in order for a person to be successful in losing weight, he or she needs to find foods that are healthy and tasty. You can’t follow a diet if you don’t like the food, it won’t work. You have to figure out what will work for you. For me, it’s all about tricking my brain into thinking I am eating unhealthy food, when I am really not. Take green beans: I flavor them with I Can’t Believe It’s Not Butter spray. That way, I get the taste of butter with less fat. I’m not saying that I don’t ever eat some less healthy food every now and then, but it’s just that — occasionally, and just a little bit. I always eat a salad or tons of green beans before I eat anything else, that way my body is getting the good stuff first. After a few months of getting my diet under control, I decided that if I included some exercise into my daily routine I could lose even more weight, and more quickly, too. I started walking. I could only go very short distances, but every week I would go a little farther until I eventually was walking between three and six miles a day. I did this from June to October, and lost a lot of weight doing so, but eventually it wasn’t enough anymore. That is when I started doing aerobics, and lost 38 pounds from November to December. The last two pounds I just lost recently, after being at the same weight since December. I am so happy that I can finally go into any store and find clothes that actually fit me. I am still getting used to that. I went to the doctor recently, and he hadn’t seen me since last February. He walked in and said, “Oh my gosh! Did you have your stomach stapled or lap band surgery?” I told him neither, I just started eating healthy and working out, and the weight started to fall off. My doctor said that I can finally come off of my blood pressure medicine if I want to. He and I went back through my chart and discovered that I weigh less now than I did when I was 10 years old! Now that says a lot. I feel so much better than I ever have in my entire life, like a new person. Now I am finally able to run and play with my 3-year-old daughter. 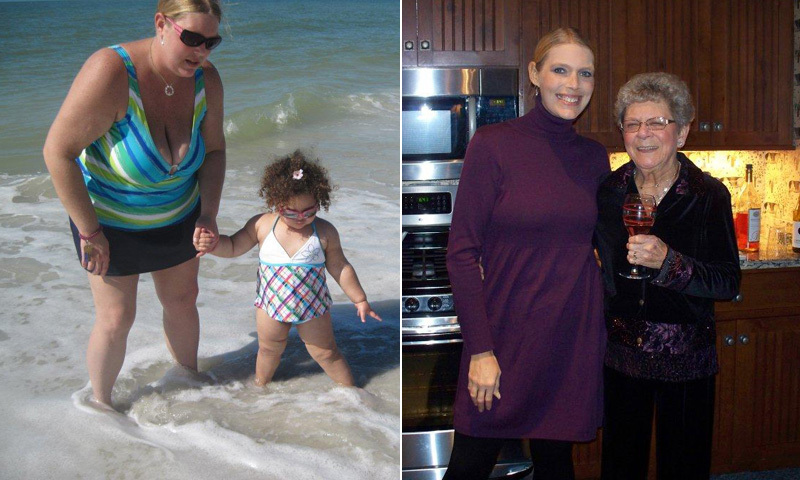 Since I have been eating healthier, my daughter has lost weight, too! I used to be able to hardly make it up a flight of stairs; now I run up the stairs with ease. I have never felt better. I have more energy then I have ever had in my life and I am so happy. 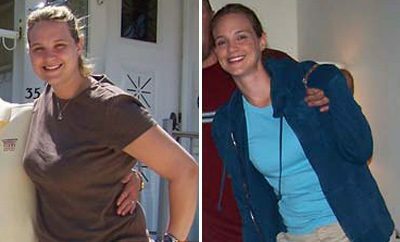 ← Previous Story Weight Loss Before and After: Brittany Drops 207 Pounds And Takes Her Life Back! Just wondering if you are sleeping better? Good for you . Juices are a no no too. I cut them out 100% and it helped so much . Stay healthy! You look awesome! I tell myself everyday no more sprite. But I still buy it. How stupid is that ! Good for you! You look so much younger and happier! Awesome, love the part about eating green beans before!! Love your story ! You look great !!! !